Torn on this bra. The gore floats slightly at the top but with the style of this bra I am not sure it is an issue? Comexim suggested a 90 band and there is no way that would work as the 95 is tight. I will go for a 100 band next time and a different cup style. The bra fits best with crossed straps in the back which is how it was intended to be worn. 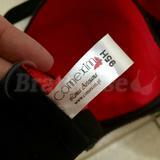 Otherwise great quality bra as always with Comexim. The red is gorgeous with the black!